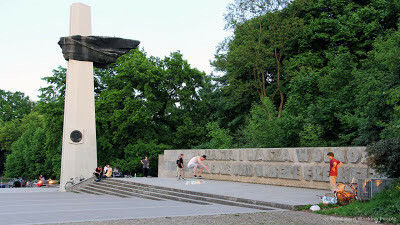 Volkspark Friedrichshain (People's Park) - In A Berlin Minute (Week 159) from Luci Westphal on Vimeo. Volkspark Friedrichshain (People's Park Friedrichshain) is on the border of the neighborhoods Prenzlauer Berg and Friedrichshain and conveniently located along the M10 tram line. 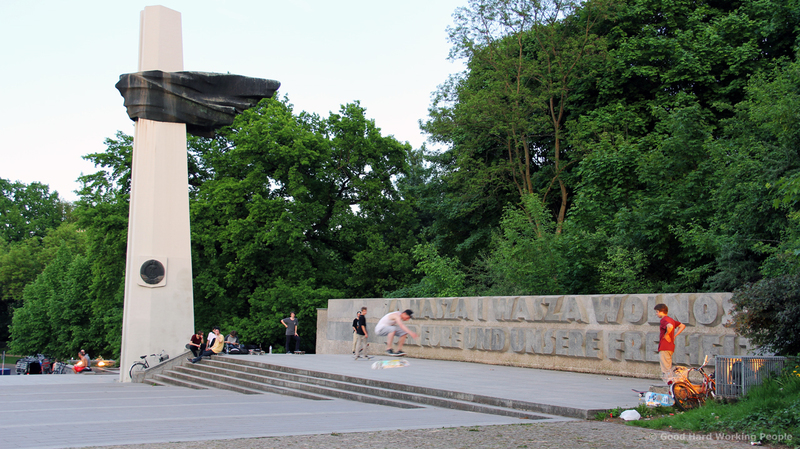 It's the oldest park in Berlin and one of its largest. During the years of the Cold War it was an East Berlin park. Besides the usual big lawns, canopy paths, majestic trees, and the quintessential beer garden (it's Germany after all) this park's special features are all the different urban sports you can enjoy and (in addition to a few large scale political memorials and statues) it features the lovely Märchenbrunnen (Fairy Tale Fountain), which you can see at the end of the video already, but to which I will dedicate a future In A Berlin Minute completely. This is actually a park I have not spend all that much time in. I remember well the first time when Scott and I had just bought our black European bikes and made a trip to that park our first ride. I remember how exhausting it was to ride up the hills in the park (which like many Berlin parks are built out of World War II debris) - but how absolutely lovely it was to escape the city and chill out in the luscious green nature. Zooming through the shot of the beer garden / restaurant is my friend Adam, who is a very successful gay hipster travel and lifestyle blogger (Travels of Adam) and vlogger working out of Berlin. I'd like to note that he describes himself and promotes his work as a hipster traveler. The significance of this is that almost by definition all hipsters claim to not be hipsters. I think it's charming when finally someone embraces this term instead of pretending otherwise. The song is the appropriately titled "Sunburn" by Jason Matherne of Goonygoogoo Productions.